The news today is not good, and I want to tell you, my friends, America today is face-to-face with a national calamity that our people little dream about. We're exactly at the crossroads. We're at a place where something is brewing that is going to happen to the United States. It's prophesied, and it is absolutely sure, and our people are dead asleep. It's going to affect you; it's going to affect your town; it's going to affect your home. You had better listen. Now I'm going to get away occasionally, in these every day and every night programs, from just going through the New Testament to show you how we have gotten clear away from the gospel that Jesus Christ brought, as we've been going through for a long time: Matthew, Mark, Luke and John. But also, I'm going to go into the prophecies of what is going to happen to the United States. This thing is so absolutely realistic, and it's so near, and the time is so short, you must know what is laid bare in the prophecies of God. Now God Almighty says that He will never let a punishment or calamity come to His people without first warning the people through His own ministers or prophets. Do you know that your Bible is literally full of it? I wonder if you realize that one-third of your Bible is prophecy — the entire gospel of Jesus was concerned with prophecy — and that about ninety percent of all prophecy is relating to our people and the conditions into which we are being hurled headlong right now. Now in this broadcast I want to begin in the book of Jeremiah, and I want to show you some of the things that Jeremiah prophesies that I have not had time to do (and I do not always have time to go into as much detail as I would like). Many times I have read little portions in these broadcasts on prophecy, of the things in these early chapters of Jeremiah, but I haven't had time to really dwell on it. And I'm going to take the time to really go into detail and give it to you. Do you have a Bible? Go and get it, and open it to Jeremiah, and you're going to have some real breathtaking surprises coming. And I tell you, it is about time we begin to wake up and realize what is foretold for us, and what is going to happen to the United States of America. I say, America wake-up! It is later than we think. Now he was the last known king to sit on the throne of Judah in Jerusalem, "...and unto the carrying away of Jerusalem captive in the fifth month." Jeremiah 1:4-5 Then the word of the [Eternal] came unto me, saying, (5) Before I formed thee in the belly I knew thee [God said to Jeremiah]; and before thou camest forth out of the womb I sanctified thee, and I ordained thee a prophet unto the nations. Two things I want you to notice there, real quickly. He is one of three men mentioned in the Bible as having been sanctified, or set apart, before they were born. The other two are John the Baptist and Jesus Christ. They're the only three that are mentioned as having been sanctified for such a great special mission before they were born. And I mention that just to show you that Jeremiah is a very important prophet, and these are very important words. Jeremiah 1:6 Then said, Ah, Lord [Eternal]! behold, I cannot speak: I am a child. It is supposed that he was about seventeen years of age, at that time. I have not been able to verify that. I don't know that that's authentic, but he was very young. He was not sent just to Judah alone, but to other nations. That's the second point I want you to notice. God said, "I ordained thee a prophet unto the nations," plural. It was both Israel and Judah. Remember that Israel was a different nation from Judah; that the tribe of Judah had split off from the nation Israel (had seceded and formed a new nation), and that Benjamin and Levi went along (that is most of Levi went along with Judah) and formed a new nation called the kingdom of Judah. Now Israel had been taken captive over a hundred years before this event, and before Jeremiah came to the peak of his ministry, at least. He was a young man when he started, but he was an old white-haired patriarch before he finished up his life's mission. Now he also was a mediary in the captivity of Judah (the land of Judea), on the part of the King of Babylon, Nebuchadnezzar. Now let's take the Moffatt translation, not that it is more accurate. Frankly, I don't think it is at all (perhaps not as much so), but it is in much plainer English. And I have the authorized King James Version here before me, and also the Revised Standard Version, as well as the Moffatt translation. Now I want you to get this in the Moffatt translation. I'll begin with the tenth verse there. Jeremiah 1:10 (Moffatt) There! [God said] I have put my words into your mouth; here and now I give you authority over nations and kingdoms, to tear up, to break down, to shatter, to pull down, to build and to plant. He planted the throne that he had torn down in Judah. He planted it in Ulster, in north Ireland. My friends, I was in Ulster in north Ireland. It's a beautiful country. Well, Jeremiah finally went over there. But that isn't the point I want to get to, that's just in passing. There's something more important for you and me today that we're going to come to very soon, so listen carefully. Jeremiah 1: 11-12 (Moffatt) This word from the Eternal came to me [Jeremiah writes, and here's what God said, quote]: "Jeremiah, what do you see?" [and] I said, "[A] shoot of a wake - tree." (12) [and] The Eternal said to me, "You have seen right; for I am wakeful over my word, to carry it out." In other words, whatever God says is sure to happen. It's absolutely certain. And when I read to you what is going to happen to the United States, and to your city, and to your home in the very near future, God is "wakeful" to carry it out. And I say you had better listen! Jeremiah 1: 13-16 (Moffatt) [verse 13] The word of the Eternal came to me again, saying, "What do you see?" [and] I said, "A boiling cauldron, fanned from the north." [and] (14) Then the Eternal said to me, "From the north is bane being blown [of] all of the inhabitants of the land. (15) For I [God says] am summoning all of the empires of the north; they shall come and erect their tribunals, each at the entry of Jerusalem and opposite all its walls round about and opposite all of the towns of Judah; (16) by them [God says] will I pass sentence on the wickedness of those who forsake me to offer sacrifice to other gods and [to] worship what their own hands [have] made. My friends, we're in still the pagan forms of worship today. We're doing those things that the pagans have done in worshipping their gods. Only we claim we're worshipping our God by their ways, their methods, their systems, their philosophies, their beliefs, and their customs and practices. And God says that we are not to seek the ways of the pagans and of the heathens, and try to worship our God with them. He will not accept it. And it's because ancient Judah was doing that very thing that God is saying now that He's going to send that punishment. Now He's speaking, now specifically, of the punishment that did come between 604 and 580 B.C. at the hands of the Chaldean Empire from King Nebuchadnezzar of Babylon. Now there is, however, the principle of duality here. Jeremiah is set over the kingdoms, more than one. He is telling specifically of what was happening, or going to happen, in his very day and lifetime (the very lifetime of Jeremiah, that is) to Judah, the Jewish people, in the land of Palestine (in the land of Judea). Now the kingdom of Israel, as I mentioned a moment ago, had been driven out and taken into a captivity to Assyria over a hundred years before this. But there is a duality, and as we go along you're going to see that he specifically mentions the house of Israel (the kingdom of Israel), which were not the people among whom Jeremiah was living at that time there. They were the kingdom of Judah. Listen my friends, never once in all the Bible are the people of Judah, the Jewish people, called the kingdom of Israel or the house of Israel. They are called the people of Israel, the children of Israel (which they were), in a number of places. They were all individually children of Israel, and individually they are so spoken of in the Bible. But collectively or nationally they are never spoken of (the kingdom of Judah, or the people of the kingdom of Judah, who were known as the Jews, the Jewish people), are never spoken of as the kingdom of Israel or the house of Israel. Never! Always, that means the ten tribes. And the ten-tribe people were never called Jews. Believe it or not. The first place in your Bible where the word Jews occurs is II Kings 16:6, and there the Jews were at war against Israel. And Israel, then allied with King Pekah of Assyria, was at war against the Jews, and taking the town of Elath away from the Jews. Turn to your Bible and read it. That's the first place the word Jew occurs. And there, Jews certainly can't mean Israel. Israel is different. They're a different nation fighting the Jews at that place. Now if you don't understand the identity of the United States, my friends, if you don't understand where we are mentioned in the Bible prophecies, above all things you must read our booklet, United States in Prophecy (United States and the British peoples in prophecy). My friends, you can't understand Bible prophecy unless you have that key. That is a veritable key to an understanding of the prophecies. Why the prophecies of the Bible have been grievously misunderstood, and no wonder, because this vital key that is needed to unlock prophetic doors to understanding had become lost. There's no story of fiction that you ever read that is so strange, so absorbing, so packed with suspense, as this gripping story of the Bible. It makes the Bible the most interesting book you ever picked up when you come to understand it. And this will open it to your understanding. 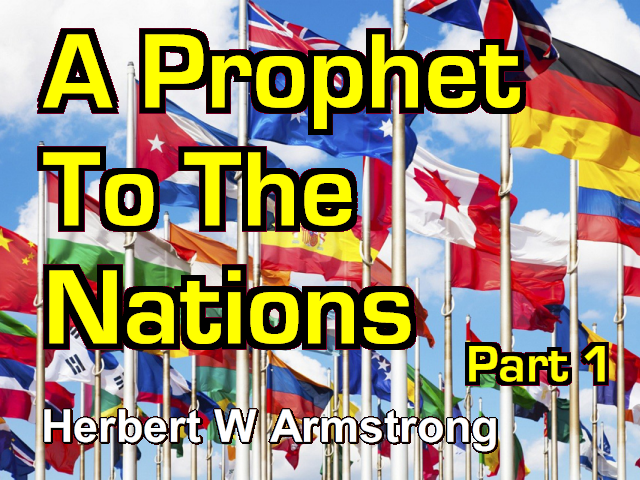 Write in for that booklet, United States in Prophecy. I'll announce it again at the close of the program. This is talking about us and our people. Now my friends, if anyone wants to argue, I have no time for argument. The word of God is too precious for that. If anyone wants his own way, and wants to say you can't prove that there's a duality here, I'm not interested in trying to prove it. God has revealed it to me. I know it. If you want to know the truth, if your mind is open and your heart is willing, I'm sure God can reveal it to you. And it is the truth: that there is a duality here, and that this is speaking, indirectly, of what is now going to happen to us as well. Now later He comes to specific prophecies about us. Of course, the duality principle in God's word always has a former fulfillment that is literal and specific, and then a later fulfillment, of which that is the type that is to happen later. Now the former fulfillment here was of the Jewish people in the land of Judah at the hands of King Nebuchadnezzar of Babylon. So He said, Jeremiah 1:16 (Moffatt) "by them will I pass sentence on the wickedness of those that forsake me and offer sacrifice to other gods, and worship what there own hands have made." Now God is no respecter of persons. God never changes. He is the same yesterday, today and forever. And where we're doing the same thing today, He is going to send the same punishment on us. And I want you to notice that God does take pagan Gentile empires — those that do not know Him, that are worshipping foreign strange gods, those that are in themselves evil — He will take evil forces, and powers, and nations, and use them to punish His people when His people forsake him. He has always done it. He used the king of Assyria and the Assyrian armies to come and invade the Israelites in the northern part of Palestine (that is, the house of Israel or the kingdom of Israel), and they were conquered, and they were removed from their homes and their cities, and Gentiles were placed in those cities in their stead. Now God is commanding me to tell you. The people of Judah didn't listen to Jeremiah, and the punishment came. Most of you are not going to listen to me today. It isn't popular. You don't want to listen. Now my friends, I can't help it if there is not another voice in the world that is warning you of these things now. This is the message straight from God Almighty. You can heed it or not. God has made you a free moral agent. If you heed it, you can come under divine protection and you can save your own skin. But if you choose not to heed it, if you choose to sneer at it and to take it lightly, and to listen to the great majority, and the deceivers that are in the majority (and the whole world is deceived), and you want to go along like a dumb sheep with the rest of the people, you will share their destruction. Now you have heard that word, and it is by authority of God Almighty through Jesus Christ in whose name I speak. And I advise you to heed. Jeremiah 1: 17-18 (Moffatt)... tell them what I command you; never be scared at them, lest I scare you at the sight of them. (18) I [God says,] "I fortify you this day like a town, a bronze wall, against the whole land, against the kings of Judah, the authorities, the priests and the laity..."
The preachers didn't believe him then. He was standing alone. He was the messenger from God. He wasn't in with the common church people of the time. The priests had all forsaken God. They wouldn't listen to this thing. Neither will the people listen today; neither will the government listen today; neither will society, as a whole, listen today. Jeremiah 1:18-19 (Moffatt). . . the authorities, the priests and the laity; (19) they shall attack you, but they shall not overcome you, for I am with you to succor you. God Almighty has said that in this day He would open a door that His message, His truth, could go to the world. Well, God has always protected us. And God said He would open the door, and no man could close it. There's been a great many attempts to close the doors of radio and the printing press, that God Almighty has opened, that this broadcast can go to the whole wide world. My friends, it's going. Man can't stop it, although there have been efforts to stop it, I can assure you. It isn't popular. The priest and the government officials and others will not back it up at all. Well I say, search the scriptures whether these things be so. You don't need to take my word for it. As I've said so many times, you can prove what I tell you. So listen. Jeremiah 2:2-3 (Moffatt)... I remember your early devotion, the love of your bridal days, how through the wolds you followed me, through lands unsown; (3) Israel was set apart for the Eternal, so dear to Him, so sacred, that her spoilers were all punished; ill befell them. Jeremiah 2:4 Hear ye the word of the [Eternal], O house of Jacob, and all of the families of the house of Israel. Now my friends, never once in all the Bible does that expression mean the Jewish people. That means the ten tribes. Now my friends, this is addressed to the ten tribes who had gone into the only captivity that has ever happened to them, over a hundred years before these words were written. Now listen — listen carefully — this is to the house of Israel. I told you we would soon see that there is a duality and that this message is for us today, as well as to the Jewish people six hundred years before Christ. Jeremiah 2: 4 (Moffatt) Listen to the Eternal's word, "O house of Jacob, and all the families of the house of Israel." And that in the twentieth century is the United States and Canada and the British Commonwealth of Nations. So listen! Jeremiah 2:5 (Moffatt) What did your fathers find wrong in me that they went far from me [yes, our forefathers Israel — in those days they always strayed away from God, they], went empty after idols and [they] became empty themselves? Yes, and we're empty, and our lives are empty, and our hearts are heavy today. God help us. And today, if you get the duality, He has brought us to a garden-land: the United States and the British Isles. Oh, what a wonderful land. You know, we sing songs about our wonderful land of the United States and how much we love it. Yes, we love this land, don't we? It is a garden-land and God gave it to us. So God says, "Yes, I brought you [up] to a garden-land, to eat the fruit and [the] good things of it." And my friends, we have luxuries, and we have material comforts and benefits and luxuries, such as no other nations have ever had in the history of the world, at any time and any place — never before. And God has given these things to us, if we can only understand. Jeremiah 2:7 (Moffatt)... but when you entered [God says], you befouled my land and you made my heritage abominable. Now of course, that is referring directly to Palestine. But also it is referring, secondarily and in its antitypical sense, to us today in this land. And it certainly applies to us today. God help us to take heed. Jeremiah 2:8 (Moffatt) The priests never asked, 'Where is the Eternal?' those who handled the law cared nothing for me, the rulers rebelled against me, the prophets prophesied by Baal, and sought useless idols. No, the pagan's don't. Did the Chinese or the Japanese or the people of India change their gods? Did the descendants even of Ishmael, the Arab race, change their gods? NO! Has any other people but us ever changed their gods? Jeremiah 2:11 (Moffatt)... But [God says] my people have changed their Glory for a useless thing! We've taken up the beliefs and the doctrines of the pagans, and the customs of the pagans. And because we put the name of Christ on them and call them Christian, we're deluding and deceiving ourselves that we're all right. Someone has to tell you these things, my friends. God says, "Cry aloud, and spare not and show my people their sins." Will you heed when you're shown? It's going to be a witness against you, I warn you, if you don't. God says, if you try to turn away from hearing, that His people are destroyed for lack of knowledge. Because thou has rejected knowledge, God says, He will reject you if you do. Jeremiah 2:12-13 (Moffatt) Well may the heavens be appalled and shudder [God says]; (13) for my people have done a double wrong, they have forsaken me, the reservoir of fresh water, and [they have] hewn out cisterns for themselves, leaky cisterns, that cannot hold any water! We have forsaken the religion that has the true waters — the Holy Spirit — and we've hewn out cisterns of pagan doctrines, and pagan customs, and pagan beliefs that can't hold any water, that offer no salvation, while we deceive ourselves (and in plain modern English, we "kid ourselves"), that we're all right. God, wake us up! Jeremiah 2:14 (Moffatt) "Is Israel a defenseless serf, a home-born slave ..." And remember he's talking about the house of Israel now, who already had gone way up into northwestern Europe and the British Isles at that very time. This very Jeremiah, a little later in his life, went up into Ulster. Jeremiah 2:14 (Moffatt)... Is Israel a defenseless serf, a home-born slave, that he should be plundered and his towns laid waste? Jeremiah 2:15 (English Standard Version) They have made his land waste; his cities are in ruins, without [an] inhabitant [his cities in ruins without an inhabitant]. Jeremiah 2:14 (KJV)) Is Israel a servant? is he a homeborn slave? why is he spoiled [that is, spoiled at war]? And it's prophesied. I tell you, my friends, it's coming. I don't know of any other voice in the world that is giving you this warning. God help you to open your ears. You don't have to take my word. It's in your Bible, in your own home. Will you read it? Will you heed the word of God instead of the word of the people that have strayed so far from God today? Jeremiah 2: 15 The young lions roared upon him, and yelled, and they [have] made his land waste: his cities are burned without inhabitant. There it is. Now my friends, that did not happen when ancient Israel was conquered and the people were removed from their land (721 BC). The only captivity that has ever come to the house of Israel in this message says, "Listen to the Eternal's word, O... house of Israel." This is not the house of Judah. This is to the house of Israel. And He says, "your towns are going to be laid waste." That did not happen in the former captivity. That has never yet happened to the house of Israel. And Jeremiah is here saying it will. Now that proves, my friends, if you have the wit to hear and to understand, and if God has given you understanding, that means it is coming on our land. And I'm telling you it's sure. If you want to play the ostrich and think it can't happen here, if you want to depend on the armies, and the navies and the air force, and the allies, I want to tell you what God warns is going to happen for that. They don't want to hear it. Jeremiah 2:15-17 (Moffatt) Young lions roar at him, growling aloud; they lay his land desolate, empty of inhabitants; (16) men of Memphis and of Daphne strip you to be slaves; (17) have you not brought this on yourself, by abandoning your God? That is the question. And there we'll have to stop. I'm just beginning. There's chapter after chapter of this, and I want to show you what God is warning us through Jeremiah. It's coming, my friends. It's coming now as much as that destruction was coming on Judah at that day from Babylon. And this right here that I've been reading you is speaking about something to come on the house of Israel. We are the house of Israel.